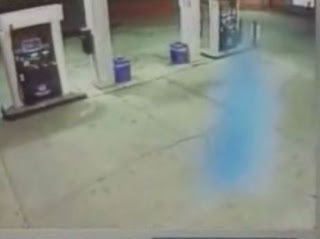 A ghost appears to have showed up at a fuel depot in Parma, Ohio (USA) recently and was caught on the station's security tape . A vivid blue image is seen floating around before flying off after about half-an-hour. Local customers who viewed the tape had a number of theories. Some thought the apparition was an angel, while others thought the eerie vision was a spirit from an old Indian reservation, though all agreed the price of gas today is enough to spook anyone. I wonder though if anyone at the depot actually experienced it in person ?